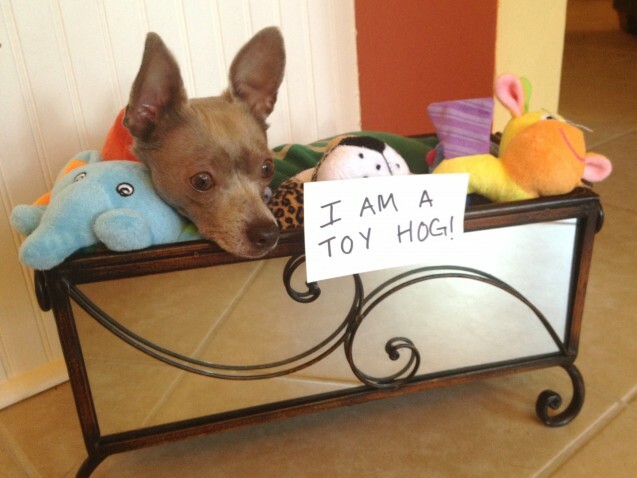 I am a toy hog! I take my afternoon nap in the toy box, so none of the other chihuahuas can play while I snooze. I am a foster dog with the Animal Rescue Foundation in Mobile, Alabama. I am looking for my forever home and a gigantic toy box filled with the best toys ever! Check me out here! Ahhh! Disembodied head dog! Seriously though… Ashton’s a cutie and I hope he gets a snuggly home soon! Reminds me of the closet in “E.T.” hehehehe. What a cutey.